A home base is a place online that you own, that is your online ‘home’. For me my home bases are blogs but for others they will be other types of websites. 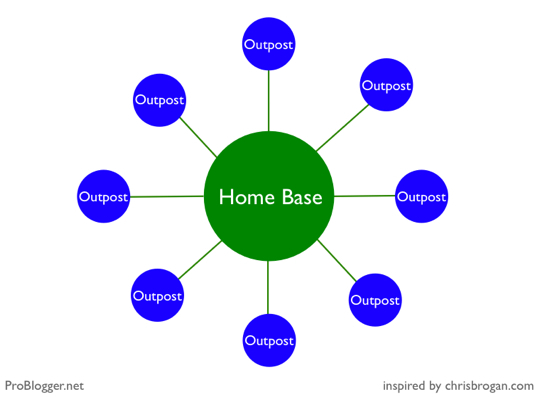 Outposts are places that you have an online presence out in other parts of the web that you might not ‘own’. 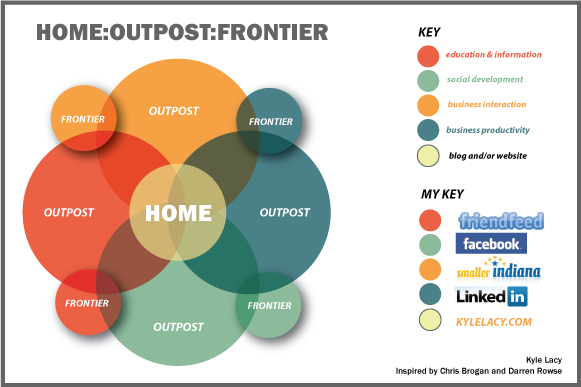 Chris Brogan also talks about the concept of Outposts in his post, Using Outposts in Your Media Strategy. Chris explains that an outpost is another way to define a social media service that brings awareness to the homebase, much like an outpost in mulitary terms. A: the part of a country that borders another country; boundary; border. B: the land or territory that forms the furthest extent of a country’s settled or inhabited regions. My social media definition of frontier: a website or service you have a presence on but rarely go. This is a site where you may have an RSS feed plugging your most-used social networks (Twitter) or your blog. The concept of frontier can be compared to Chris Brogan’s idea of a passport but shed in a little different light. Above you will see an illustrated example of my use in Social Media. This is a mesh between Chris and Darren’s ideas, as well as my previous idea of the 4 Touch Points Model for productivity in social media. In order to stay productive in Social Media I try to use four sites that cater to four different aspects of my life: education, social development, business interaction, and business productivity. You can read more about what these four sites mean in my being productive post. The four social media sites where you spend the most time would be categorized as outposts. I use the “home base” to center my four outposts and vice versa. The frontier sites sit on a completely different level. Examples could range anywhere from Digg to Technorati or even Twitter. The frontier is a place where you have a presense (RSS FEED) but you have not cultivated the actually site in regards to your time. They also represent different combinations (overlaps) of the outpost sites. This is a work in progress and I would love your thoughts. What should be added? How do you use social media? I am open for ideas! What is your outposts and frontiers? Now that’s pretty interesting. I like those intersection ideas in the frontier perspective. It continues to make sense to me. The premise of WHERE the various frontiers intersect is clearly more symbolic. You don’t exactly only get business from one outpost, but maybe you get MORE business from one over another. Right? Kind of neat to look at, and I’m glad you shared it. Right. If you are using social media as a networking tool for your business you can gain contacts from all the community platforms. I have found that some networks are more beneficial than other (ie: more contacts). What is beyond frontiers? Territories owned by others maybe? These can be labled as other’s blogs and social networking or media sites. Where you comment and make yourself known frequently. They are also fundamental strategies to building brand equity and garnering readership. That is a good question. I think you can categorize other “home bases” into the frontier status. It would be interesting if we could get a visual representation of that! You going to do it? It’s wicked to see this idea being explored! From the perspective of a music marketer, I’ve always thought about it as if you are planting seeds and nurturing the growth of these micro-communities of fans across any number and type of social networks with the intention of then pulling them in to your website where you can facilitate interaction and gain information about fans. I love the ‘Outposts’ and ‘Homebases’ model as it gives my ideas more structure, and assures me I’ve been on the right track in my thinking. The fact that you’ve taken it to frontiers, and Steven talking about what is beyond frontiers, makes me excited to see where we can take these ideas. I think I’ll start working on a blog post of my own exploring this. I’ve created a blog post on my ideas above. Yeah I like it too. I actually wondered about having two levels of 'outposts' in my own chart – one that is where I have an account and don't do much else and another where I'm more active. For me I'd classify Friendfeed as a frontier and Twitter as an outpost. I also think frontiers can sometimes become outposts and outposts can sometimes become frontiers. For example, for me Plurk was an outpost for a while but lately I've let it slide and become inactive (and I guess it looks more like a frontier). I also like the overlapping aspect of your diagram because sometimes there's definitely a blurriness between them. For example for me my tweets get picked up on facebook so there's a relationship between the two – yet they are also separate to some extent. Absolutely right Andrew! It is extremely important to not go about social media haphazardly! I agree with Steven Sanders. This is all about building your brand. Your blog being the ultimate representation of ‘you’. The Outposts and Frontiers are places to build relationships that ultimately help build your brand. This really makes you stop and think about how you use or don’t use the various Outposts and Frontiers that are available. You have to make a commitment to the entire package. Only by doing that will you reach your goal, whatever that may be. This is a concept I have been doing myself and have been getting decent organic traffic. It is not the quickest way to build but I think experimenting in the frontier portion will help increase a quicker following. There are some very solid ideas here, especially the concept of establishing a home base – not just for businesses, but for individuals as well. Have you fleshed out this concept since (I see this is from '08)?